I made a promise that this wouldn’t turn into my author page, and it won’t, trust me. Heck, I’ve already got one of those right here. Today, my new science fiction, action/adventure novel series Operation: Harvest kicks off with The Fog of Dreams. I’ve been working on this novel (and this entire universe) for probably almost ten years, and seeing it this close to culmination is almost like a dream come true. I honestly and completely believe that if you love G.I. Joe, there will be things about this novel that you love as well. There are many common themes between the two universes, as one might expect with my 30+ year fascination with A Real American Hero. I won’t dwell on it, I won’t mention it every day, but I will talk about it from time to time, fair warning. If you’re interested, hit up the link below to pick it up on Amazon! The Kindle version is only $2.99 (you can read it for free with Kindle Unlimited!) and the paperback is $12.99. I have worked very hard and invested a lot of money into making it the best I could. Please give it a try. The Fog of Dreams, my first non-G.I. Joe novel, now available for pre-order on Amazon! Obviously, if you’re coming here, you’re a G.I. Joe fan as am I, and I believe you’re familiar with the fact that I’ve been writing G.I. Joe fiction. Well, I’d like to take a moment to announce that next Tuesday my brand new novel will be released, and it’s my first piece of non-G.I. Joe fiction to be published! It’s the beginning of my own little universe, my own little crowded section of the publishing world. And honestly, I think it’s something that G.I. Joe fans will really enjoy. The paperback is available now, the Kindle version is open for pre-orders, ready for delivery August 11th (next Tuesday). I’m extremely excited about this (although admittedly, also nervous) and hope that anyone who is interested will give it a chance. It will also be available via Kindle Unlimited next week. I’ll try not to clog this feed with sales pitches for my non-G.I. Joe stuff, but I’ll warn everyone up front, it will get mentioned from time to time. Hopefully no one minds too much. Released for pre-order on August 1st, local publishing company announces the first novel from captivating new trilogy series. PRLog – Aug. 6, 2015 – LEBANON, N.H. — Known as the “self-publishing revolution”, many smaller publishing companies are making their debut to the public and Wolf’s Head Publishing is no exception. Justin Bell is the owner of said company that was created as a launching point for his own series of thriller-based books. “The basic premise is that anyone can become a small publisher. You call the shots. You retain the rights to your book and you take home a bigger royalty than you’d normally get from a traditional publisher – if you sell any books,” notes CNET’s David Carnoy in a recent article. While the publishing business may be tedious for some, Bell has made it clear that he’s up for the challenge. After getting his start in writing for the G.I. Joe Universe for the Amazon Kindle Worlds platform (http://www.amazon.com/Justin-Bell/e/B00K3U3EE6), Bell’s own works have become one the most popular making the author one of the highest selling writers in that category. His first novel in the upcoming “Operation: Harvest” trilogy is titled “The Fog of Dreams” and is classified as a “thriller and suspense genre” novel. The book boasts strong action and military elements. Bell’s novels in the “Operation: Harvest” trilogy feature genetic manipulation and conspiracy theory as overarching themes throughout the entire trilogy, as well as the strong bond between family; especially fathers and children. The 332-page suspense novel is now available on Amazon (http://www.amazon.com/Fog-Dreams-Operation-Harvest-Book-e…) as of August 1st, 2015 for only $12.99, with its launch set for other digital book stores in the coming weeks. Kindle Unlimited subscribers can borrow the book for free as well. The novel is available both digitally or in print for customers. Bell is hoping that the birth of his own universe will provide stories and characters that will captivate readers for years to come. Founded in 2014, Wolf’s Head Publishing was created as the springboard for a new series of suspense and thriller novels. Originally developed as a self-publishing company for author Justin Bell’s works, the hope is for it to evolve into something larger. Its mission is to bring exciting action, superhero, and suspense novels to a growing reader base that is desperate for new entertainment. The company’s owner and lead author, Justin Bell, has been writing for most of his life, with works in everything from fiction to technical education, news stories, and online blog and opinion posts. The story of William Strickland and Operation: Harvest is one he’s been “dying to tell for the past ten years” is newly released on Amazon.com. For media inquiries regarding Wolf’s Head Publishing, individuals are encouraged to contact Owner and Author, Justin Bell directly at 603-252-5624 or via email at admin@wolfsheadpublishing.com. To learn more about the company or the novel, please visit: www.wolfsheadpublishing.com. What a difference a few weeks makes, huh? It wasn’t that long ago I was determined to spread my wings a bit and start introducing new content to GeneralsJoes to keep the updates fast and furious. Well, here we sit, with no updates in five days. What’s up with that? In short – life has been real busy. My week break for JoeCon created a pretty massive build up of “real life” stuff and mixed with that, I’ve had my nose to the grindstone working on the review for the 2015 Convention Set. As most folks know, I think, I do a pretty thorough job on the convention items, and essentially work on 20 different reviews simultaneously. So, pretty much any second I’ve had not spent on important “real life” stuff has been spent on Con Set reviews. I don’t have a specific ETA yet, as I have some QC issues that the Collectors Club is very kindly assisting with. But as soon as I can get them wrapped, I’ll get them posted, and hopefully start drifting into more regular updates. I appreciate everyone’s understanding and support. More content to come, I promise! ST. LOUIS, MO. – April 08, 2015 – The premier G.I.Joe information and fan site for nearly two decades, YoJoe has been leading the charge in the G.I.Joe collectors’ community with innovative solutions for tracking and managing collections. Big or small, vintage or modern, YoJoe is the single source for up-to-date news and the most comprehensive G.I.Joe collection database on the internet. For the past two years, the YoJoe team has been hard at work developing an all-new way to manage your collection with our YoJoe Pro Collection Management System. Offering collectors the ability to track items in their collection, document prices paid on items, upload collection photos, create a personalized Have/Want Checklists, and even buy, sell or trade directly thought the YoJoe Pro platform. We are excited to announce that after an extended Beta Testing period, YoJoe Pro is now available to the entire G.I.Joe collecting community as a monthly subscription service. Every collector is invited to come and join in with a FREE 30-day trial of YoJoe Pro. The pricing for YoJoe Pro fits every collector’s budget and need. You can subscribe for $3.00/month, $30/year or $55/for two years. Membership has its benefits! 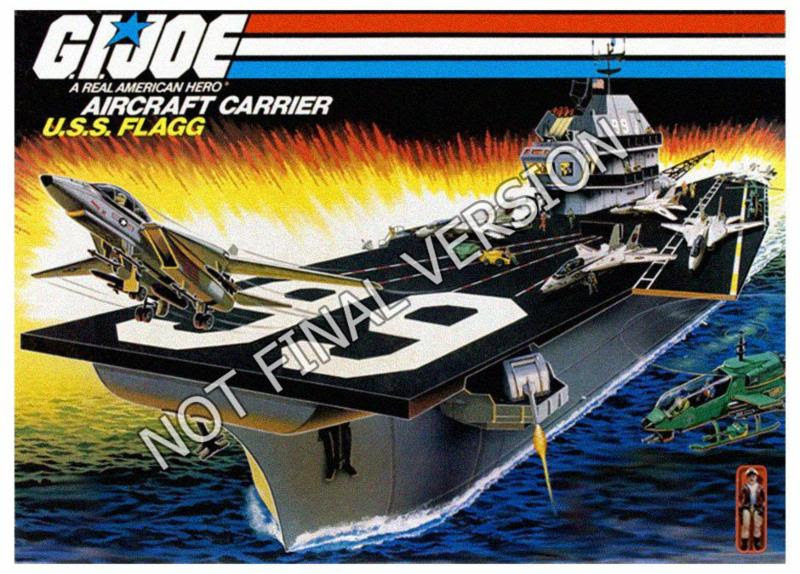 Be one of the first 50 to pre-enroll for two years and receive a YoJoe-exclusive print of the iconic USS Flagg Aircraft Carrier artwork. YoJoe creates so many different ways for collectors to interact within the hobby and G.I.Joe community – from social media to the database and forums, event coverage, editorials and so much more. We are very proud to bring our latest technologies to the community and we are excited about doing so much more. Please join us as we continue to deliver all new and exciting ways to collect G.I.Joe. YoJoe.com is made for collectors, by collectors and we are counting on your support. Thank you and Yo Joe! It’s a sad day for toy fans everywhere. According to HISSTank.com (via the Commercial Observer) the Times Square Toys “R” Us location is likely to decline renewing their lease for the store, although they are likely to get some other retail space nearby. I’ve gone out of my way to visit this store every single time I’ve been to the city (which was for about 7 straight years for various Toy Fair events) and I’m very sad to hear of its closing. It wasn’t some “toy mecca” of new product or the latest and greatest toys, but it was a statement of the impact of toy stores on all of us, young and old. With a Ferris Wheel, a lifesized Barbie Dreamhouse, a looming dinosaur, and an environment of out of this world fun, it was a fantastic place to visit, even if it rarely had the newest G.I. Joe toys I was looking for. I had always promised that I’d bring my daughters to it one day, and I’m sad that this is likely never to come to pass, it’s an experience I’m certain they would have enjoyed, even if their favorite Frozen toys weren’t in stock and ready to buy. I think it’s safe to say that most of you reading this site are like me, and are kids of the 80s, and self proclaimed “geeks”. The world we live in today is almost a haven for geekdom, with blockbuster movies based on our favorite comic books, the Star Wars universe continuing in theaters and on television screens, and with pop culture almost becoming synonomous with all of the things we love. And I love talking about those things. So, you may see some of this stuff start being interspersed among my regular G.I. Joe news. I will endeavor to not water down anything that I discuss in regards to G.I. Joe, but I feel like I need an outlet to talk about these other things, and frankly, I think the site needs to talk about some of these other things to continue its growth. G.I. Joe is still my first love, of course, but it’s not my only love. I’ve made no secret that I try to promote some Amazon sales through my site to not just bring to light some good deals, but also because as an Amazon Affiliate, purchases made through my affiliate link help support the website. I try to keep the shilling to a minimum, but with Black Friday/Cyber Monday coming up, I figured this might be a good time to showcase some deals. G.I. Joe Section – Toys, Comics, Cartoons, and Movies! Merger talks between Hasbro and DreamWorks Animation cooled off? A few short days after initial reports hinted at a potential merger between Hasbro and DreamWorks animation, the latest word is that those talks have come to an end. According to the New York Times, a dip in stock prices and internal pressure from Disney may have contributed to the deal falling apart. It’s not especially surprising giving Hasbro’s deep relationship with the Mouse, being the primary licensor for many of their action figure brands, not to mention just recently sweeping the princess license away from Mattel. Disney is a very powerful voice in the industry and not one you want to be on the wrong side of. It’s tough to say exactly what the combined forces of Hasbro and DreamWorks might have meant for the G.I. Joe brand, and now it appears we’ll never find out. Get more details at the New York Times.